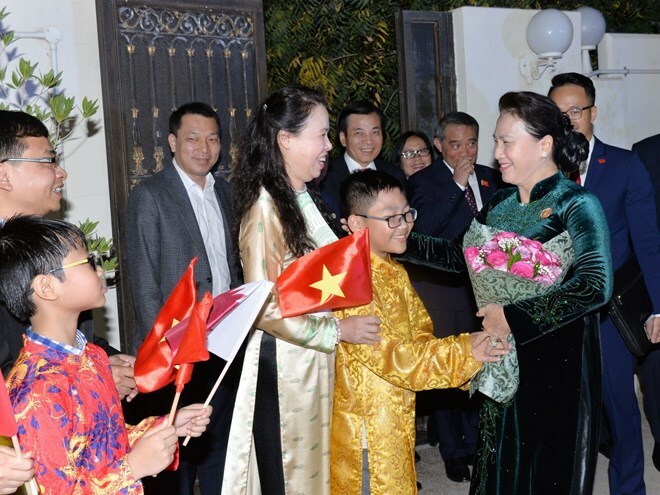 Doha (VNA) – National Assembly Chairwoman Nguyen Thi Kim Ngan said she had asked leaders of Qatar to receive more Vietnamese workers as the Western Asian country is preparing for the 2022 World Cup finals. The NA leader disclosed the information during her meeting on April 7 with staff members of the Vietnamese Embassy in Doha and representatives from the Vietnamese community in Qatar. Head of the liaison office of the Vietnamese community Nguyen Trung Hieu informed the NA Chairwoman that there are about 1,400 Vietnamese in Qatar, most of who are workers in the construction industry. Vietnamese Ambassador to Qatar Nguyen Dinh Thao reported to the NA leader the embassy’s operation since its opening in Doha 10 years ago. The two countries marked the 10th anniversary of their diplomatic relations last year, and the good political and diplomatic ties between the two nations provides a firm foundation for promoting economic, investment and tourism cooperation, Thao said.